When I first signed up for eMeals clean eating recipes, I didn't think I would actually find any I would want to make. I thought that a lot of my favorites would go out the window and I'd be stuck making things that may be "clean" but not tasty. I was completely wrong and this recipe is one that proves it. Last weekend I wanted a summer meal for our Saturday dinner. 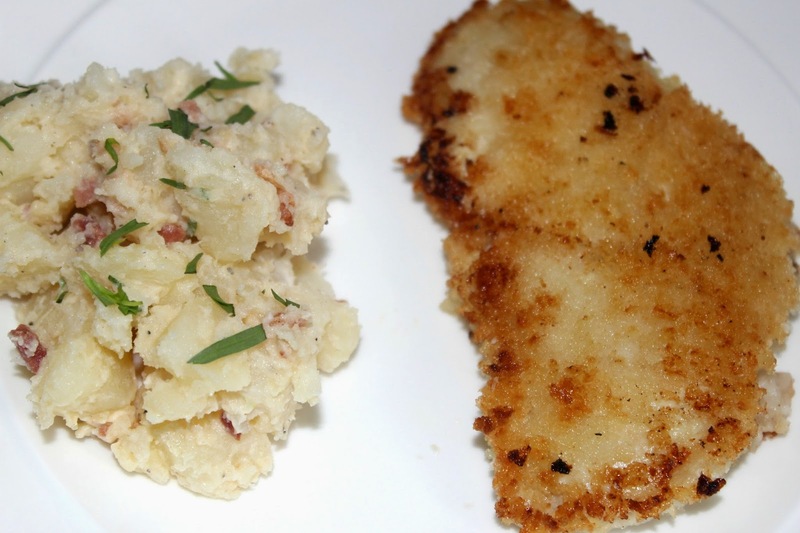 Cold potato salad and crispy chicken sounded like the perfect summer meal. One that would be perfect for a BBQ or even a picnic. The chicken was so quick and easy to make. Besides boiling the potatoes, so was the potato salad. I honestly can't remember the last time I made potato salad. I forgot how easy it was and how much better it is then what you buy at the store. I added some small pieces of turkey bacon that was leftover from breakfast that morning, which hubs enjoyed. Definitely a meal we'll make again and a potato salad I'll bring to our next BBQ. Enjoy! Preheat oven to 375°F; sprinkle chicken evenly with salt and pepper. Whisk together sour cream, milk, green onions and paprika in a shallow dish; place panko in a separate shallow dish. Dredge chicken in sour cream mixture then in panko, pressing gently to adhere. Heat oil in a large nonstick skillet over medium-high heat; cook chicken, in batches, 2 minutes per side or until browned. Transfer chicken to a lightly greased rimmed baking sheet. Bake 10-15 minutes or until done. Bring potatoes and salted water to cover to a boil in a large Dutch oven; cook 10 minutes or until tender. Drain; let cool, and cut into quarters. Whisk together vinegar, mayonnaise, mustard, salt and pepper; gradually whisk in oil. Pour dressing over potatoes; add tarragon, and toss until well coated. ** eMeals is a subscription service that sends weekly meal plans to your inbox based on information you provide. We've been very happy with the recipes so far! There are many nights where I don't feel like cooking. Mostly on the weekends. Lately, we've been trying to watch our eating out spending, which means a lot more weekend meals at home. A few weeks ago, we decided to plan all of our weekend meals and not eat out once. Including Friday night. This was big for us. When I planned our weekend menu, I looked for recipes where I could reuse the ingredients. Since our Saturday morning meal was homemade breakfast sandwiches using bacon, I choose this dinner recipe for Sunday night. I'm not a huge fan of the original BLT. I need more in my sandwich. But, this. This is a sandwich I am a fan of. Plus it's a clean eating recipe! Cooking the bacon was the only thing that took time. The rest was simple to throw together. I think what did it for me was the basil-avocado combination with the bacon. So much flavor in every bite. Serve with sweet potato fries and you're all set! We've made this meal twice since, it's one of our favorite at home lunches. Cook bacon in a large nonstick skillet until crisp; drain on paper towels. 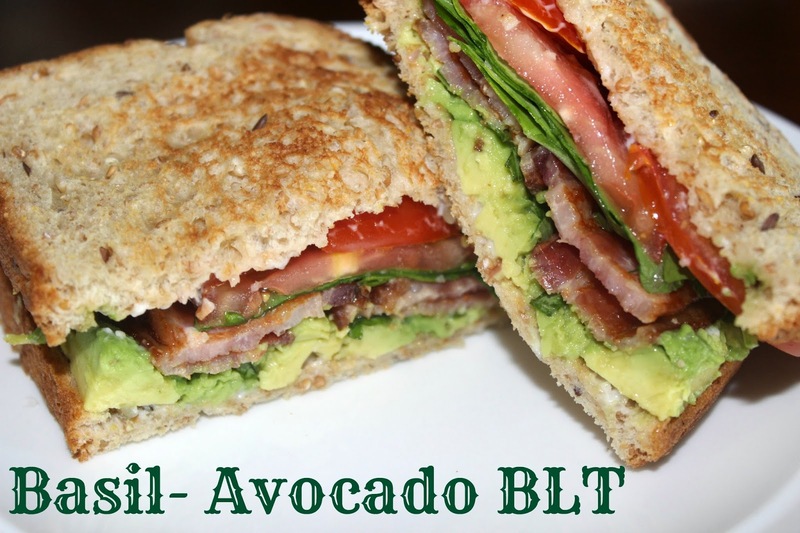 Spread toasted bread slices with mayonnaise; top 6 slices with bacon, avocado, tomato, arugula and basil leaves; top with remaining bread slices, mayonnaise-side down. 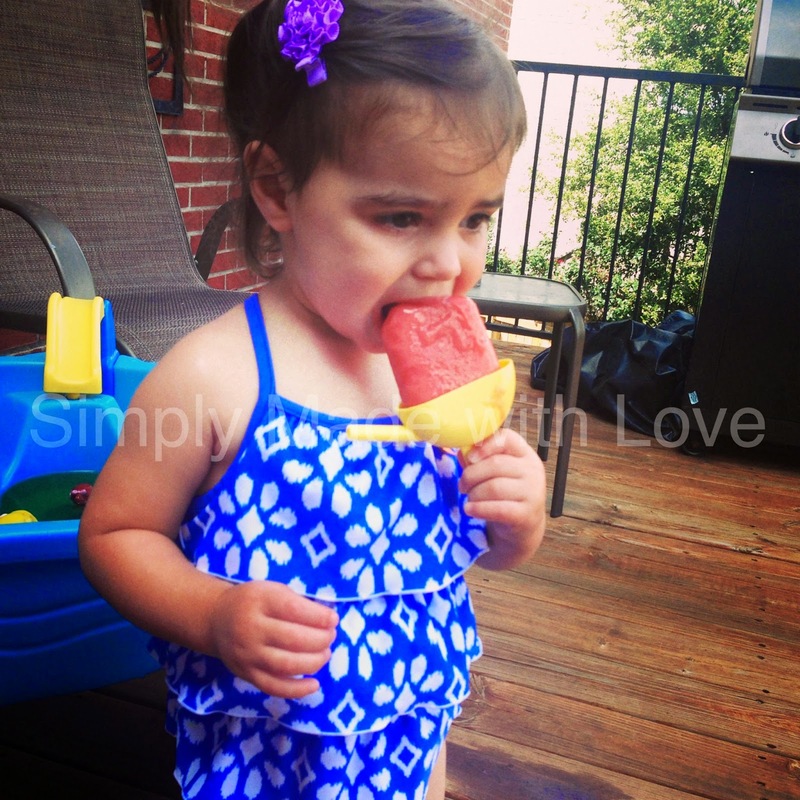 One of the items on our Summer Bucket List was to make popsicles. The weather here in TX was well into the high 90's in May. The mini and myself were craving something cool to enjoy in the afternoon heat. For me, there's nothing better than homemade popsicles. Especially out on the deck while watching the mini splash around in her water table. 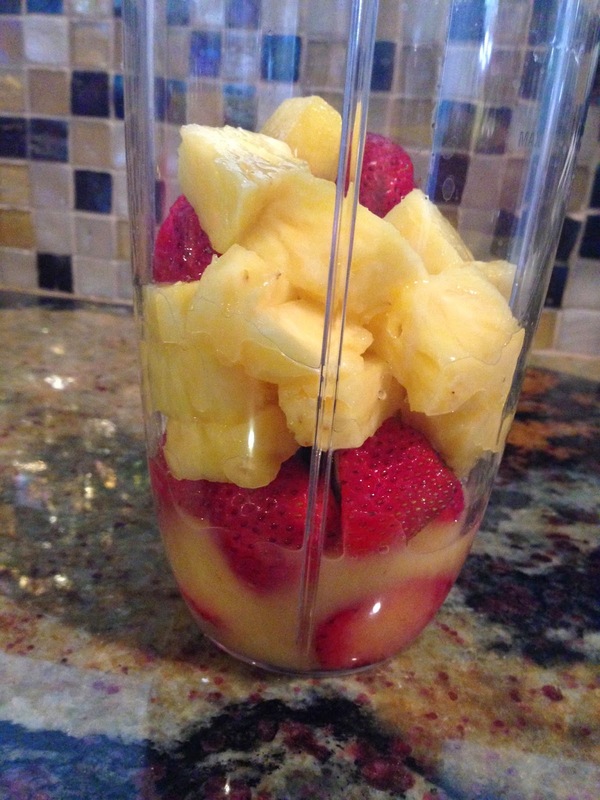 Put the strawberries, pineapple and OJ into a blender. I used my nutribullet. I blended it until it was completely smooth. 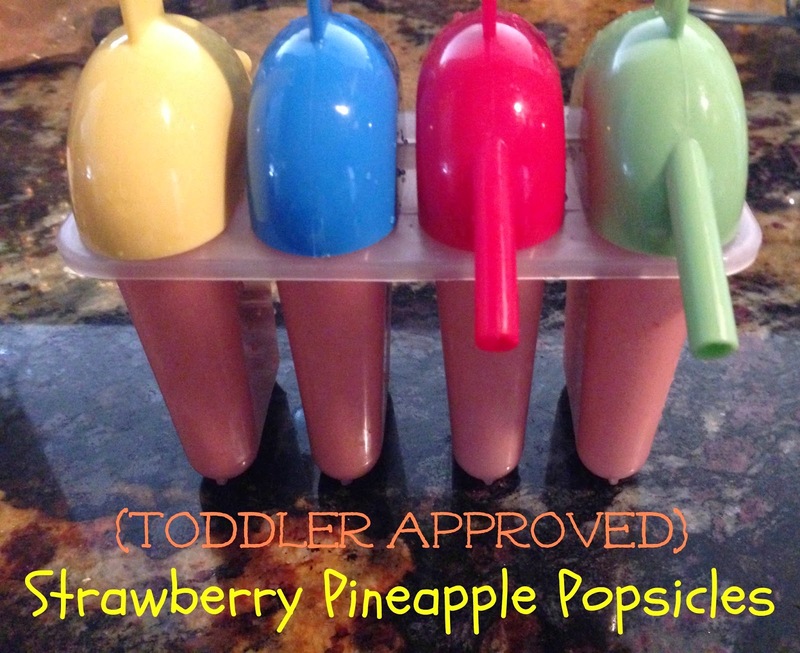 Once that was done, I poured it into popsicle molds I found at Bed, Bath & Beyond. 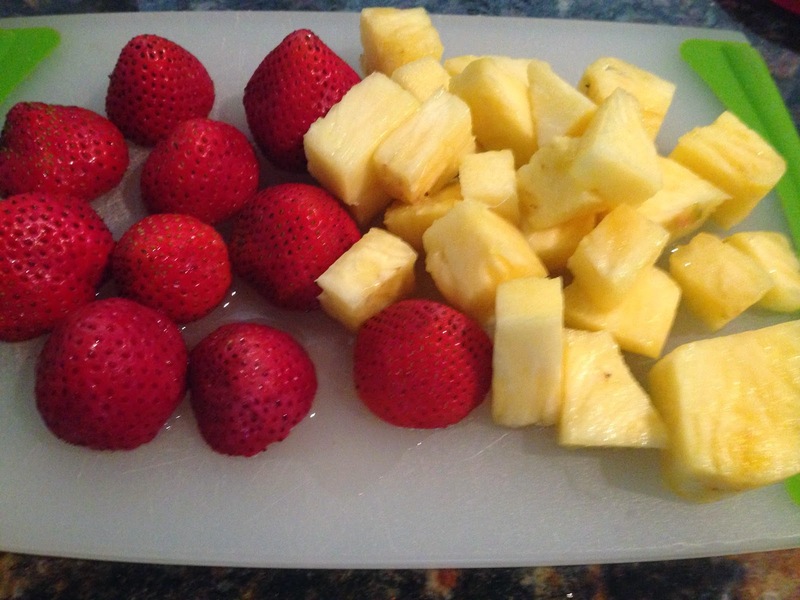 Freeze for at least 5 hours or overnight. Enjoy! Today, I'm sharing one of our favorite new dinners. This meal takes about 25 minutes to make. It's one of the meals I will throw together when I am running late getting dinner started or am looking for a quick and healthy meal. It also makes a perfect lunch. Hubs adds chicken to his, I personally think this is filling just the way it is. Enjoy! Mix ingredients and leave on the stove until everything is heated through. Guacamole is a weekly staple in our house. Hubs, the little one and myself all love it. Since hubs lived in New Mexico growing up, he has special ingredients that he uses to make his guac. I've tried to replicate his recipe many times, but I don't come close. It's famous among our friends and always a favorite at a party. Since I did the menu planning and most all of the cooking for the 4th of July, I wanted to surprise him with a new guac recipe. Not to replace his, but something different. I found this recipe on Pinterest. As someone who loves feta cheese, I knew I would love it. I was a tad worried about what everyone else would think. 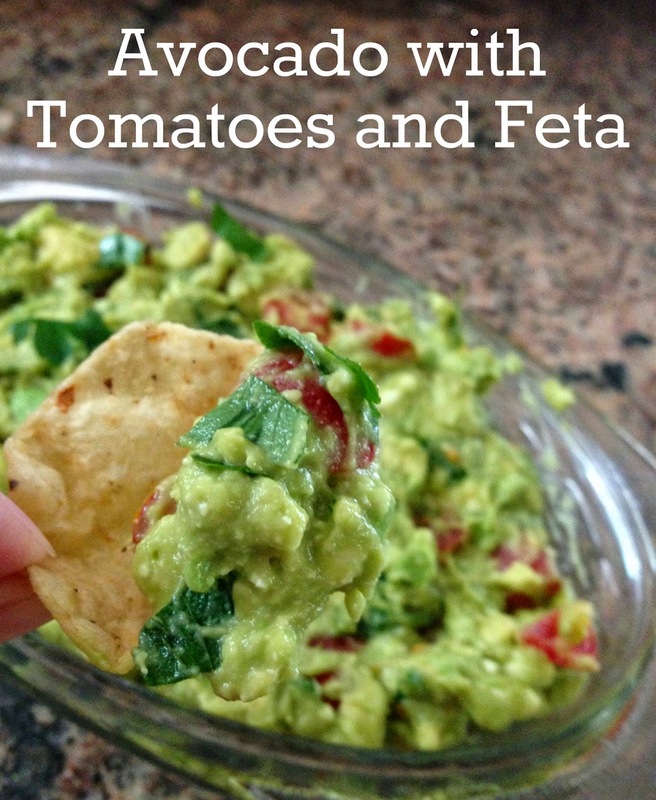 Results: A welcomed change to the normal guac appetizer. Unbelievably fresh and full of flavor. Perfect for summer BBQ's! 1. 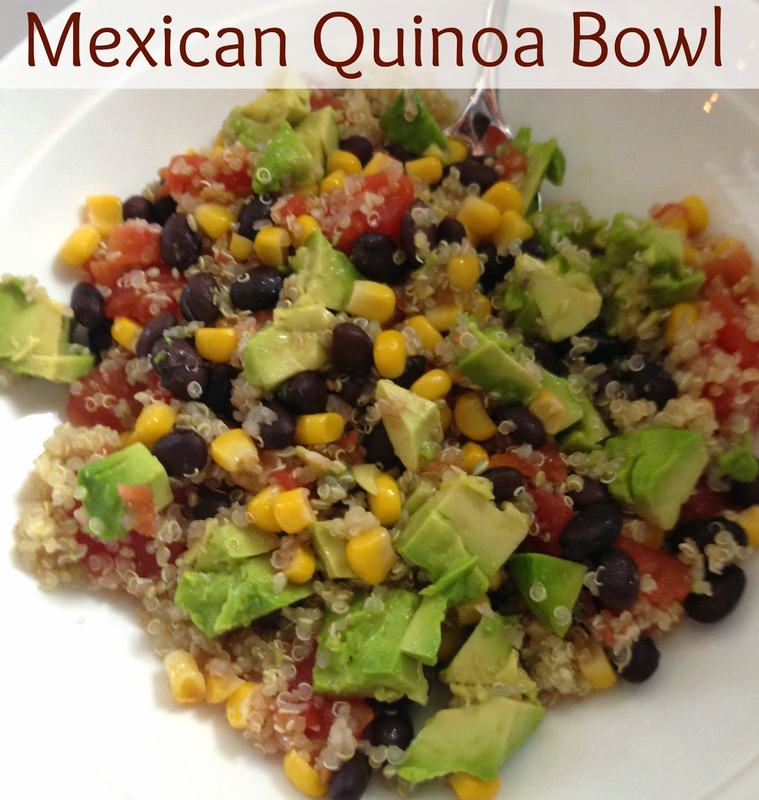 Combine all of the ingredients together in a large bowl. I made this pasta salad for our 4th of July BBQ. My MIL doesn't like mayonnaise so I searched for a recipe that didn't include it. Out of the few I found, I knew this one would be the people pleaser. Overall, the recipe was easy. The only thing that takes time is the bacon and cooking the pasta. Once those two ingredients are ready, the rest is easy to throw together. 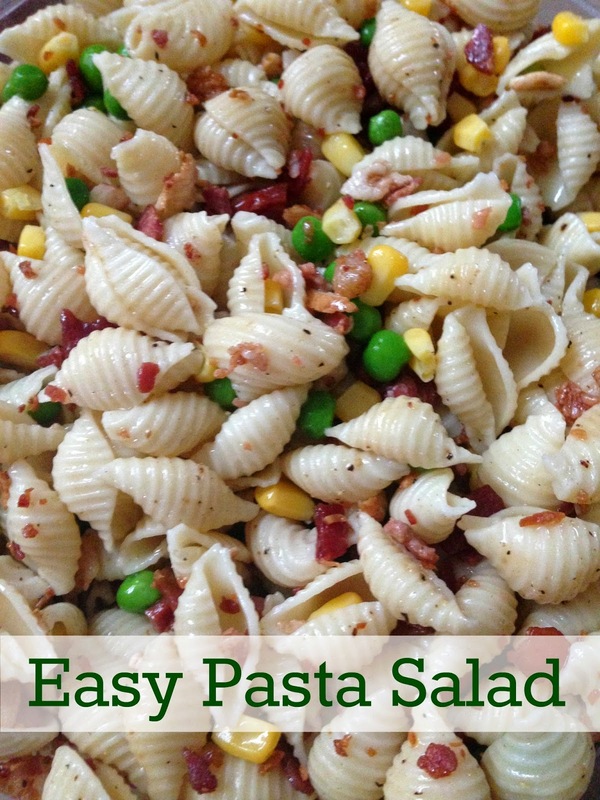 I personally prefer a pasta salad with a heavier dressing, but this is a great alternative and much lighter. My 2 year old ate this up. She wasn't a huge fan of the corn but ate everything else. I definitely recommend making this a few hours before serving and refrigerated to let the flavors come together. You can also serve this salad warm. Enjoy! Bring 6 cups of water to a boil in a medium pot on the stove. Add corn and peas and cook for 2 minutes. Drain in a colander and set aside. Cook pasta and drain into the same colander as the corn and peas. Set aside. Zest and squeeze juice from lemon into a large bowl. Add in garlic, salt and pepper and stir to combine. Add pasta, corn and peas to the bowl. Then add in butter and bacon and stir to combine. Season with salt and pepper to taste, if desired. It had been a few months since we made baked donuts for breakfast. Hubs has been on a pancake kick lately, which is fine by me. For Father's Day I decided to take back the kitchen and make these donuts, along with eggs and bacon. 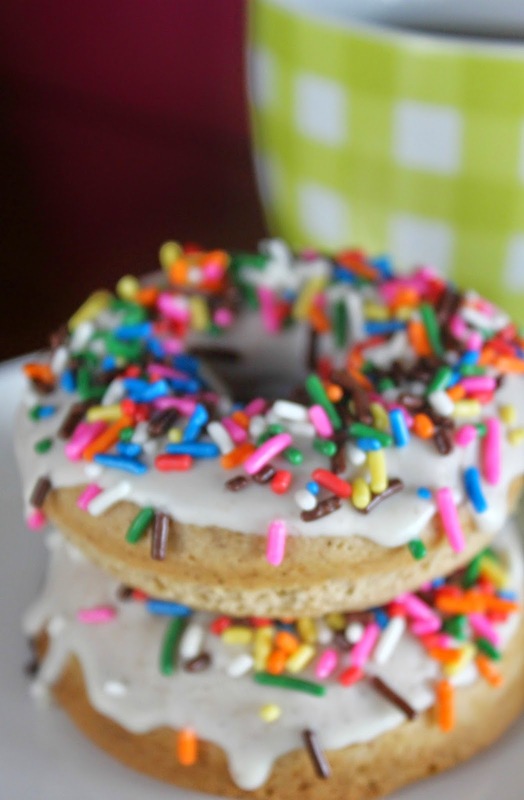 Usually when I make donuts, I use a cake mix with a few added ingredients. 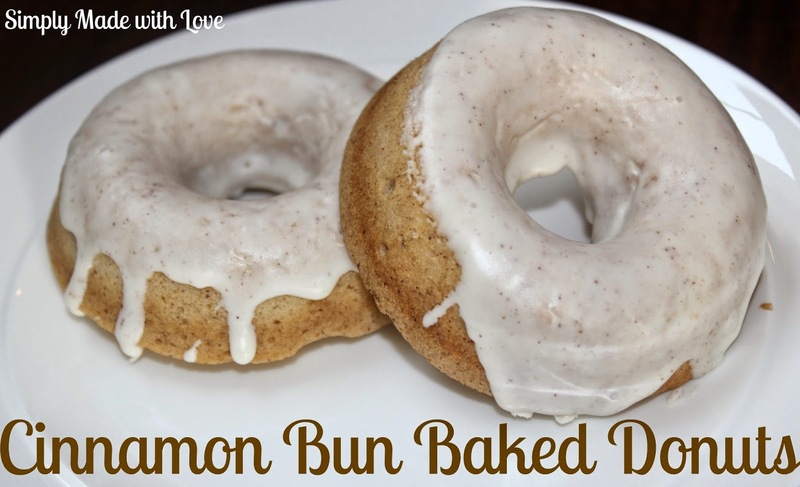 While these took longer to make, they were much better than any of the cake mix baked donut recipes we've tried. They weren't as dense as cake mix donuts, much easier to handle and eat. I also loved that it only made 6 donuts. I have a tendency to make an entire batch with the cake mix recipes and the extras end up sitting in the freezer until they're thrown out. Hubs and the little one both ate their fair share. It's safe to say this recipe will be around for a while! Pre-heat oven to 325 and lightly grease donut pan. I use coconut oil spray. In a mixing bowl, mix together flour, sugar, baking powder, cinnamon, and salt. Add milk, egg, vanilla and melted butter. Mix to combine. Using a quart or gallon size plastic bag with a corner cut off, pipe the batter into a 6-donut pan. After attempting many other ways of doing this, this is the easiest I've found. You could also use a pastry bag if you prefer, I like the clean up with the plastic bags better. Bake 8 to 11 minutes, or until doughnuts spring back when touched, indicating they're set. Allow to cool for a few minutes before you remove them to a cooling rack. Make the glaze by melting the cream cheese icing for 10-20 seconds in a microwave safe dish. Mix it to get a smooth consistency. I added a dash of cinnamon to the mixture before dipping. I also use a low bowl, which makes it easier for dipping the donuts. Dip the donuts into the glaze once they've cooled. Immediately top with sprinkles if desired.